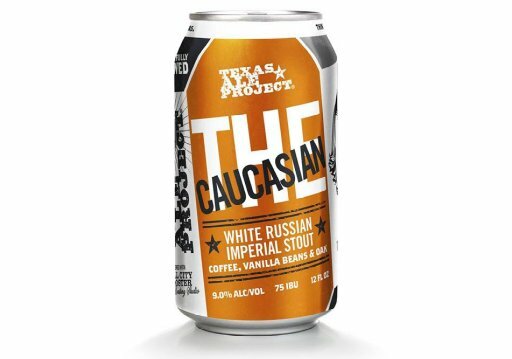 Texas Ale Project of Dallas has announced the pending release of The Caucasian in cans. Billed as a white Russian imperial stout, The Caucasian (9.0% ABV, 75 IBU) is brewed with cold-brewed coffee, Madagascar bourbon vanilla beans, toasted oak and milk sugar. It had been a draft-only offering since its debut in 2015, but now this popular winter release will be available in four-packs of 12-ounce cans during the month of December. "This ale is truly a labor of love and it demonstrates the brewery's passion for innovation and fine ingredients. Brent Thompson, head brewer at Texas Ale Project, looks forward each year to hand-selecting the coffee for the cold brew in partnership with Michael Wyatt, owner of Full City Rooster Coffee Roasting Studio." A release party for the 2018 edition of The Caucasian will take place at Texas Ale Project's facility in Dallas on Friday, December 7 from 4-9 p.m. In addition to live music and food pairings provided by Cuates Kitchen, the event will feature a screening of The Big Lebowski - the movie that inspired the beer's name.